Across the undefended border of Brooklyn and Queens. Although Dutch immigrants established some homes and farms in Brownsville and East New York in the 1700s, the area did not gel as a community until the early-to-middle 1800s. East New York was developed by John R. Pitkin, a Connecticut merchant beginning in 1835, while Brownsville is named for Charles S. Brown, who subdivided it in 1865. East New York’s easternmost section, Cypress Hills, is named for a common variety of plant found in the hills separating Brooklyn from Queens, left from the retreat of a glacier over 10,000 years ago, which produced a lengthy line of hills stretching for miles in Long Island. After the foundation of new cemeteries was outlawed on the increasingly crowded Manhattan Island in the 1840s, a great number of cemeteries, Christian, Jewish and non-denominational, were founded in Queens along what came to be known as the Cemetery Belt. In the vicinity, 17 separate cemeteries can be found. Force Tube Ave. cuts diagonally across the Cypress Hills street grid. The name refers to high-pressure tubes, or conduits, that ran under the street, connecting Ridgewood Reservoir, just north of Highland Park, to a large pumping station that stood until the mid-1960s at Atlantic Ave. and Conduit Blvd. It was part of a water system connecting Freeport in Nassau County where the Milburn Pond was tapped in the 1890s to supply water to the then-city of Brooklyn. A water conduit through southern Nassau and Queens was constructed along streets that came to be known as Conduit Ave. and Boulevard. Aqueduct Racetrack, which sat near the conduit, was also named for it. The pumping stations, conduits and reservoir had all gone out of use by about 1970. The Romanesque Brooklyn Water Works building in Freeport, visible to generations of Long Island Rail Road commuters, was damaged in a fire in the early-1990s before it could be converted to residential use, and was then demolished. The Ridgewood Reservoir remains, awaiting revival. 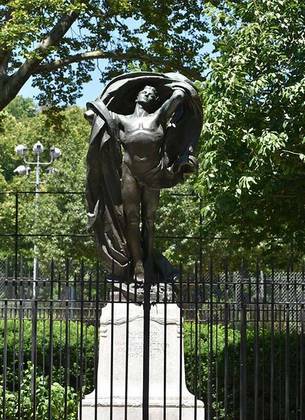 The Dawn of Glory statue in Highland Park at Jamaica Ave. and Cleveland St. was dedicated in 1924 and is the work of Italian-American sculptor Pietro Montana. This memorial, dedicated to the Cypress Hills World War I dead, reportedly employed bodybuilder Charles Atlas as the model. The city of Brooklyn purchased the original parcel of Highland Park in 1856 for the construction of Ridgewood Reservoir. In 1905, New York City added to the park by purchasing land originally situated on the Schenck family farm, and the final piece was added by 1908 with the purchase of a few acres belonging to the former Department of Water Supply, Gas and Electricity. 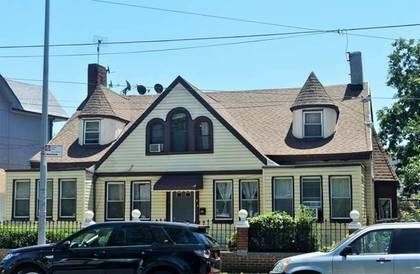 The oldest house on Jamaica Ave. is at #494, between Elton and Linwood Sts. The house was built shortly after 1800 and was located on the farm belonging to Wilhelmus Stoothoff, who acquired the land from Jan Barents Bloom in 1799. After the Civil War the Stoothoff family sold the building to Edward F. Linton, who owned a lot of property in ENY, selling some of it to the city of Brooklyn which then created Highland Park. It’s one of a handful of remaining colonial-era homes in Brooklyn. It has undergone a myriad of renovations over the years, the latest of which is this version with aluminum siding. 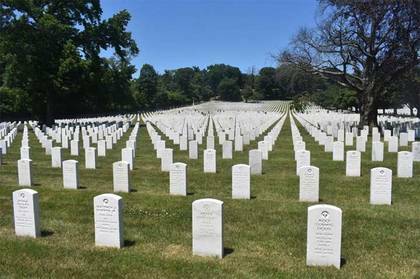 Every one of National Cemetery’s over 21,000 stones bears the cross that appears on the gravestone of a military veteran. 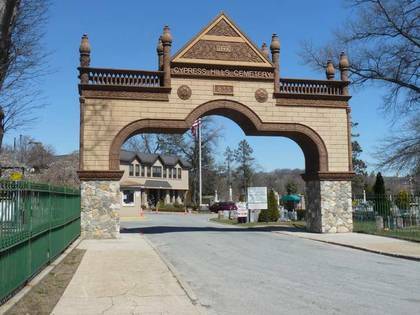 The Cemetery’s front gate is at Jamaica and Hale Aves. On July 17, 1862, Congress enacted legislation that authorized the President to purchase "cemetery grounds" to be used as national cemeteries "for soldiers who shall have died in the service of the country." The cemeteries were soon did a good business. In that first year, a National Cemetery established in Sharpsburg, Maryland became the final resting place for 4476 Union soldiers killed at the Battle of Antietam, September 17, 1862, the bloodiest day in US history. Today the National Cemetery network consists of 136 cemeteries, 120 administered by the US Department of Veterans Affairs. Cypress Hills National Cemetery is one of the original 14 National Cemeteries. Additional land was acquired in 1882 with the aid of Secretary of War Robert Todd Lincoln (son of the President) as well as 1941, when its Mount of Victory and Union plots were donated by New York State. The Mount of Victory plot is the final resting place of the last surviving veteran of the war of 1812, Hiram Cronk, who died in 1905 at age 105. Over 7000 Civil War veterans, Union and Confederate, are buried at Cypress Hills National. Only the Gettysburg and Arlington Cemeteries contain more Civil War veterans killed at Gettysburg than Cypress Hills National. Twenty-two Congressional Medal of Honor winners, marked by gold-lettered, marble headstones, are here. The Medal of Honor is the highest award for valor in action given to a member of the armed services; it’s generally awarded personally by the President. Three members of the 7th US Calvary who survived the battle of Little Big Horn, June 25, 1876, are interred at Cypress Hills National, including Italian-born bugler John Martin (Giovanni Martini) who had served in his youth under Giuseppe Garibaldi for Italian independence. Martin served as a ticket taker in the NYC subway before tokens were introduced. Nine other countries, Argentina, Brazil, Canada, France, Italy, Poland, Russia, Spain and the U.K., claim interments in the Cemetery, including 25 French sailors who died while on duty in American waters in WWI, and British Revolutionary soldiers whose remains were transferred to Cypress Hills National in 1909, the earliest war dead in the Cemetery. The flowers and decorations placed on the stones at Cypress Hills Cemetery, second largest in the area after Cemetery of the Evergreens, give it an almost festive air. The cemetery was established in 1848; interred here are ragtime musician Eubie Blake, painter Piet Mondrian, entertainer Mae West and baseball’s Jackie Robinson. …reportedly when he was just 17 years old, in 1811. The Jamaica Elevated has snaked here from the Williamsburg Bridge, following Broadway, Fulton St., and Crescent St. and joins Jamaica Ave. via a sharp curve at Crescent St. Jamaica Ave. will be shrouded by it all the way to about 124th St. in Richmond Hill, where it detours underground to meet the IND E line at its Parsons/Archer terminal. 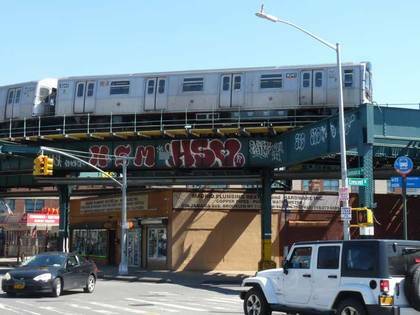 It was rerouted there in 1988 after the elevated structure out to 168th St. was demolished in 1978. The former Franklin K. Lane High School’s tower looms over City Line. 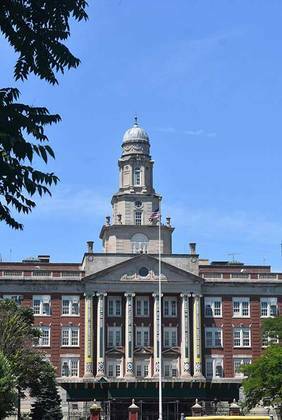 When built in 1923 and named for the Secretary of the Interior under President Woodrow Wilson, it was one of the largest high schools in the world. Over the decades it gained notoriety as one of the city’s toughest. After the graduating class of 2012 it was split into five separate schools. Among its alumni are Red Holzman, the only coach to pilot the New York Knicks to titles (1970, 1973) and actress Anne Jackson. We’ve now crossed into Woodhaven, Queens. Woodhaven and Ozone Park were settled in the 1600s by Dutch and English settlers, who gradually eased out Native Americans; Woodhaven became a racing hotbed in the 1820s when Union Course, at what is now Jamaica Ave. and Woodhaven Blvd. was built in 1820s. Centerville and Aqueduct Race Tracks would follow. From the 1830s to the 1850s, what’s now East New York and Cypress Hills, Brooklyn, and Woodville, Queens, were developed by Connecticut businessman John Pitkin. To avoid confusion by the Post Office with an upstate New York State town in the days before zip codes, Woodville residents voted to change Woodville’s name to Woodhaven in 1853. 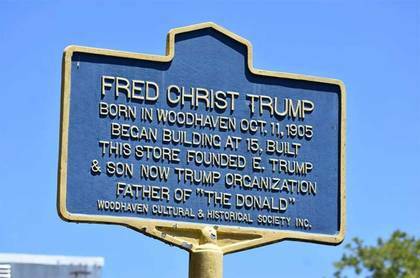 A historic sign at the C-Town supermarket on Jamaica Ave. and 78th St. commemorates a supermarket founded by Frederick Christ (pronounced “krist”) Trump, who began building middle-class houses in Queens during the 1920s and built Trump Market at Jamaica Ave. and 78th St. in the 1930s; he sold it to King Kullen shortly after he opened it. Trump Village, the project for which he is best known in Coney Island, was constructed in 1963. He married Mary McLeod in 1936 and had four children, Maryanne Trump Barry, Donald, Robert and Fred Jr., who passed away in 1981. Both of his residences in Jamaica Hills, where Donald spent his formative years, still stand. Neir’s Tavern at 78th St. and 88th Ave., by many accounts, was founded in 1829 as The Pump Room, or Old Blue Pump House, to serve Union Course patrons. The racecourse once stood across the street and hosted match races between northern and southern race promoters until the Civil War broke out in the 1860s. The racecourse closed soon after the war. The founder was Cadwallader Colden, and that name might raise a scintilla of recognition for New York State history scholars: his great-grandfather, who had the same name, was acting governor of New York and mayor of New York City in the colonial era. 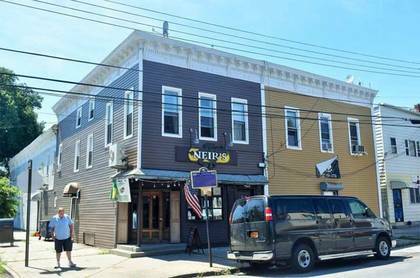 The Neir’s name comes from Louis Neir, who purchased the place in 1898, adding a bowling alley, ballroom, and rooms for rent upstairs. Mae West, who was born in Brooklyn but spent some of her youth in Woodhaven, is reputed to have sung at Neir’s. More recently it has been used as the venue for several major motion pictures. Several scenes of Martin Scorsese’s mob epic Goodfellas were filmed here, as well as a Ben Stiller vehicle, Tower Heist, in 2011. Awesome history. I was born in Ozone Park, and have a sister still living in Woodhaven. Our parents were born and met in Williamsburg. Thanks for the research! !